Instead, talk about what excites you about your candidate. How does your candidate stand on issues of concern to you? What separates your candidate from the other primary candidate? What experience will he or she bring to the office? When it comes to political primaries, let's remember who the real opponent is. When all is said and done, the primary election sets who represents our party and the general election determines the winner of the seat. Our opponent is the individual from the other party running in the general election. There's no surer way of losing the general election than by bashing members of our own party. The Democratic Party is diverse, inclusive and compassionate. Let's demonstrate those qualities with each other during this primary election. Fighting for your candidate is admirable; fighting for the bigger picture (the win in November) is imperative! With the primary election this month and general just months away: I'm hoping you are taking time to volunteer, call or canvass from our LD 17 Democrats Office (see below). 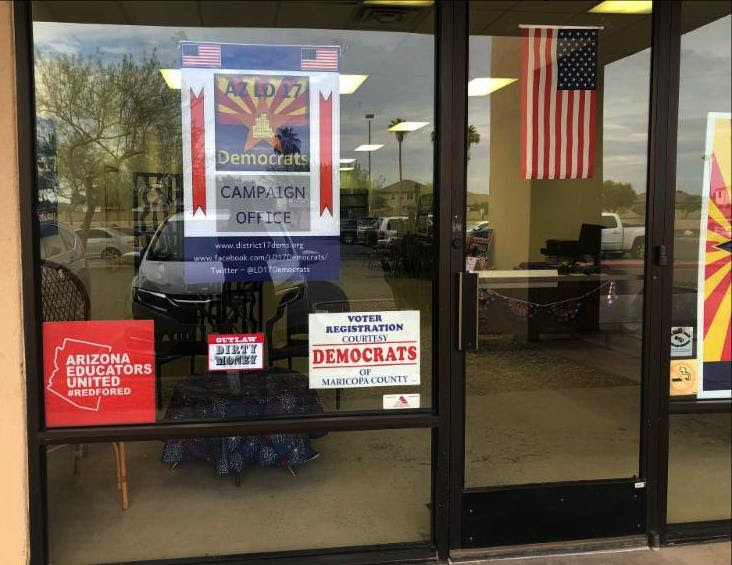 Please stop by; it is the one-stop shop for all things Democrat in LD 17. We offer lots of ways to get involved and our volunteers have done a fantastic job setting up and decorating the space (thank you!). To keep the office running and to maintain the supply of brochures and other information necessary for our district, your financial support is vital. You can donate online here. Meetings begin at 7 p.m. the first Tuesday of each month. (Doors open at 6:30 p.m.) The meeting is held at the International Brotherhood of Electrical Workers (IBEW) Local 769 Union Hall, 220 N. William Dillard Dr., Gilbert 85233. Next meeting is Aug. 7. Meetings begins at 7 p.m. on the second Monday of each month at the Sun Lakes Country Club (25601 E. Sun Lakes Blvd. N.), Navajo Room. Next meeting is Aug. 13. The Sun Lakes Democratic Club collects non-perishable food items for Matthew's Crossing Food Bank. Please bring your tax-deductible contributions to the Drop Off Area in the west parking lot from 6:30 p.m. to 7 p.m. Ask for a receipt. We appreciate all you do. 1450 W. Warner Road, Ste. 124, in Gilbert (next to Goodwill). Meet here for phone banking and to begin canvasses. To phone bank, office hours are: M-F, 10-7; Sat, 9-5; and Sun, 10-5. 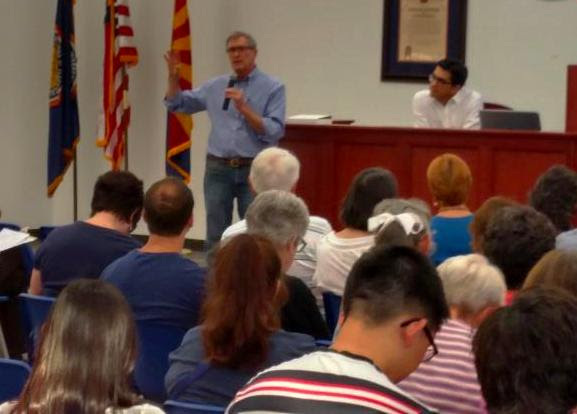 LD17 Dems - Summer PC Meeting, Wednesday, Aug. 22, 6:30pm, 220 N. William Dillard Dr., Gilbert. Recommended for all current and newly elected PCs, and open to any others who are interested in attending! MCDP Summer Unity Event - being held in LD 17!! Mark your calendars for Saturday, Sept. 15. It will be held in the evening at the Chandler Center for the Arts. More information will be sent soon and we'll need volunteers. Mark Manoil, Democratic candidate for state Treasurer, addresses our July meeting. He says we should invest some of our resources in our own community, rather than entrust everything to Wall Street. 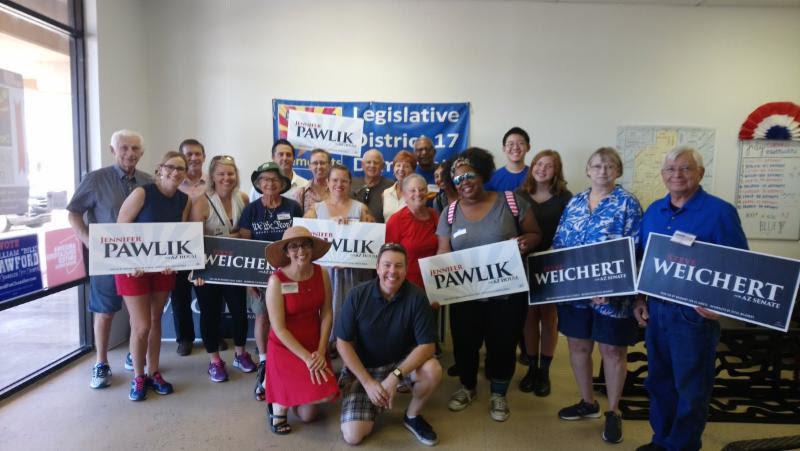 Thanks to the many volunteers who braved July temps to canvass our neighborhoods. Check out the August schedule above.